Good point, the wattage is the heat and light (essentially) BTUs. So I think the idea the HID is so much brighter just "seems" like there would be more heat involved. Your experience with the other bikes is good news. Did you power your HIDs from the CanBus or from a digital fuse accessory (required in US to power both lo and hi beams simultaneously)? They were(are) all powered through the canbus power supply that stock bulbs plug directly into. 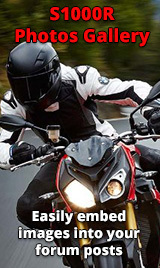 Thinking about it all again, on the K bikes and the R12GS as well as the low beams on the F bikes i Used 50w HIDs, for the high beams on the F bikes i used 35w HIDs (these had smaller housings). the 35w still put out way more light than the 55w halogen stock bulbs. Off to the garage I go for some installation fun. I also have a new HID to fit on my S1kR low beam, let me know where you find to mount and hide the ballast and igniter. And I am waiting for one to arrive for the high beam side. First, I'm going to power the HID from a digital fuse, so the lo-beam will be on full time. I'll run this feed from the dig fuse to the lamp housing, connect directly to the HID power in. I'm going to mount the power supply (ballast) under the clock support bracket; plastic item under the clocks. I'll use ty-raps to secure. The remaining bits, igniter, and wiring I'll ty-rap out of the way in the space under the P/S. When I get a chance I'll post some pictures of my installation. I went the opposite route. I installed a high power LED for the low beam and the HID for the high beam (for reasons posted above the LED high didn't work). My primary reason for the LED rather than HID is lower power consumption. 22 watts vs 50. Running the low beam off the PDM-60 is the answer. Please excuse my ignorance. What is this PDM-60 power source of which you speak? Rowe PDM-60 is a fuse block, but it is controlled electronically. It can also be programmed for start up and shutoff delays. There are 6 channels, so you can control 6 items separately. The '60' refers to a 60 amp total for the unit. A thought occurred to me today that going the PDM-60 route may in fact be unnecessary. I installed the PDM on my bike to run the many auxiliary bits I wanted- outlet for heated jacket, driving lights, USB plug, iPhone charger... Since I had it anyway wiring the low beam to it was easy. If all I wanted to do was cure the low-beam shut-off problem it seems to me that running the low beam off the auxiliary CanBus outlet might do the trick. I don't know how much juice the outlet will allow, but I'd bet that a single headlight is within its working parameters.